I’m sure most of us remember the incredible scene of the “Miracle on the Hudson.” On a winter day in 2009, Chesley (Sully) Sullenberger, successfully landed a US Airways jet in the Hudson River without losing a single one of the 155 passengers. Shortly after takeoff at New York’s La Guardia airport, the plane flew into a flock of birds, knocking out both engines. Fearing he could not return to La Guardia or another airport, Sully felt he had no choice but to do a water landing in the Hudson. Sully became an overnight hero and celebrity for his remarkable landing. In Sully, director Clint Eastwood brings this story to the screen. Tom Hanks plays Sully with Aaron Eckhart as the co-pilot, Jeff Skiles, and Laura Linney as Sully’s wife Lorraine. When watching the movie, be sure to watch the credits, when many of the actual crew and passengers appear on screen. It’s remarkable how much the actors resemble the people they play. Sully focuses upon a hearing by the TSA soon after the landing. Many experts were wondering if the water landing was necessary. Could Sully not have brought the plane back to La Guardia, or New Jersey’s Teterboro Airport? Was the dramatic Hudson River landing really necessary? Did it needlessly place all those lives at risk? Would Sully end up being discredited and even lose his pilot’s license for reckless endangerment, even in the midst of his new found celebrity? There’s little doubt how the movie will turn out. Yet it’s a credit to Eastwood, Hanks, and the cast and crew that Sully is an engrossing film. No movie actor since Jimmy Stewart has played the ordinary, decent man better than Hanks. Once again he is believable as a man who never sought celebrity. He just wanted to do his job and love and care for his family. The humble decency of Sully shines through. It’s also noteworthy that Sully never takes full credit for the amazing landing. He credits the crew, cooperative passengers, and first responders who quickly come to the aid of the plane in the water and successfully rescue everyone. This was one of the best themes of the movie. While Sully is a hero, everyone plays their part in the successful landing and rescue. No passengers panicked; they all helped one another and followed the directions of the well trained crew. Unlike the “disaster” films of the 1970’s, the passengers and crew are not overly dramatized, with their own back stories. We see them basically as the crew did that day: ordinary people trying to get to their destinations, and, by the end, very thankful to be alive. Eastwood’s film almost has a documentary feel to it, from the resemblance of the cast to actual characters to its matter-of-fact telling of a memorable story. 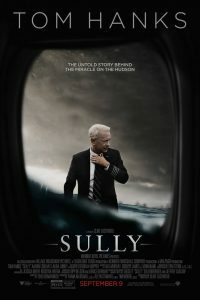 Sully tells the story of ordinary people rising to the occasion, working together for the good of all. It’s an inspirational movie, in a humble and honest way. With all the superhero movies out these days, it’s good to see a movie about real people doing amazing things.